I come from a long line of cracker devotees. My family is famous for its high daily consumption of Huntley & Palmers Cream Crackers. When all six of us lived at home I swear that we ate our way through a whole box every day. We ate other crackers too, but kiwi-made Huntley & Palmers were always king. Most of the time we ate them spread simply with butter and sandwiched together (known as “the double”), but we also loved them topped with a thin slice of cheese and often pickle too. Despite the predominance of cakes and cookies on this blog, my tastebuds swing towards savoury more than sweet. My all time favourite snack is good crackers topped with good cheese. These days I am forced to be more democratic with my cracker consumption (probably a good thing), and I’ve grown an appreciation of how different crackers can enhance different cheeses. 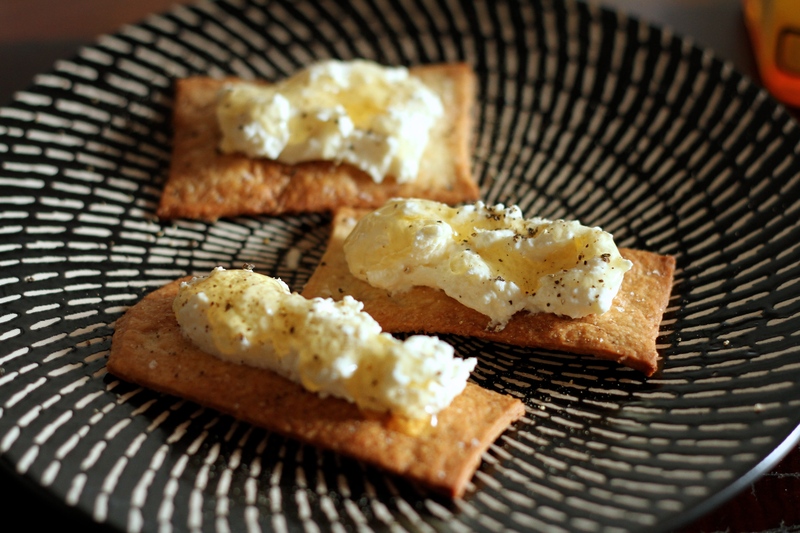 One of my favourites is a firm goats cheese with an oat wafer (divine) but I’m also rather partial to homemade olive oil crackers topped with homemade ricotta cheese. Oh, I hadn’t mentioned that before? Yeah, I make my own cheese and crackers. No big deal. Actually, it’s a pretty major deal. When I stumbled across these recipes on Brandi’s site I was totally gobsmacked for a second – homemade crackers? It was honestly a completely new and thrilling concept for me. That Brandi then topped said crackers with homemade cheese just tipped me over the edge. I’m the kind of person who gets a bit excited about complicated, time consuming recipes (a cake that takes three days to make? I’m in!! ), so the workload (and there definitely is work here) didn’t faze me one bit. I had tried other recipes from Brandi’s site and trusted her implicitly. She’s right again – the crackers and cheese are amazing. The crackers are a bit time-consuming, but only during the rolling out and baking stage. The soft, creamy ricotta is the easiest thing ever, and just takes a few hours of patience while it strains. 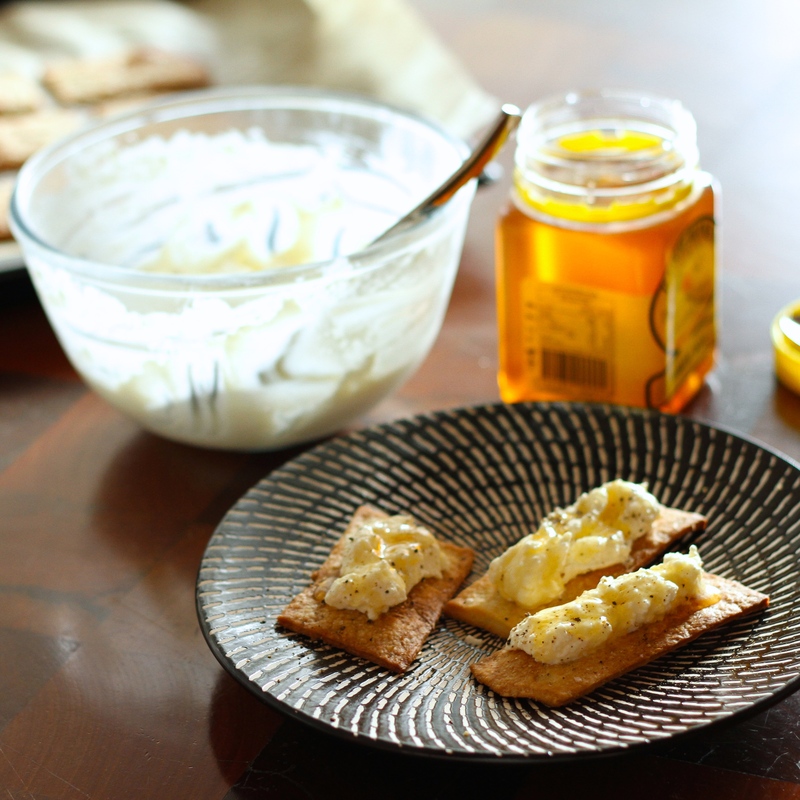 Brandi recommends topping her crackers with the homemade ricotta then a drizzle of runny honey and a grind of black pepper. This is unquestionably delicious, but the crackers are also fantastic with ricotta and smoked salmon or simply with a slice of cheddar. They are also rather good with peanut butter, although extra peanuts are clearly overkill and should not be attempted. Go on, make your own crackers and cheese: impress yourself and wow your friends (revelation of nervous tics optional). Whisk together the flours and salt in the bowl of cake mixer. Whisk the water and olive oil together and pour into the bowl with the flours. Fit the dough hook to the cake mixer and mix the dough at medium speed for about 5 – 7 minutes, until smooth. The dough should be very soft, but not too tacky. Add a bit more water or flour if needed. Turn the dough out of the mixing bowl and pat into a large ball. Rub with a little olive oil, then place in a bowl and cover with plastic wrap. Leave to one side for 1 hour at room temperature to relax the gluten. If using a pasta machine: Cut the dough into equal-sized pieces roughly the size of a billiard ball and flatten. Roll each ball into a flat strip of dough, starting with the widest setting on your pasta machine and working your way up to number 5. Transfer on a sheet of baking paper. If using a rolling pin: pull off a piece of dough roughly the size of two billiard balls. Working on top of a piece of baking paper, flatten the dough with your palms then roll out as thinly as possible to the size of a large oval. For both methods, trim the dough to make a large rectangle then slice into squares or rectangles. Brush each cracker lightly with olive oil then sprinkle with sea salt, or a mixture of sea salt and seeds such as poppy, sesame or cumin. Bake until golden, about 5-8 minutes, then transfer to cool on a rack. 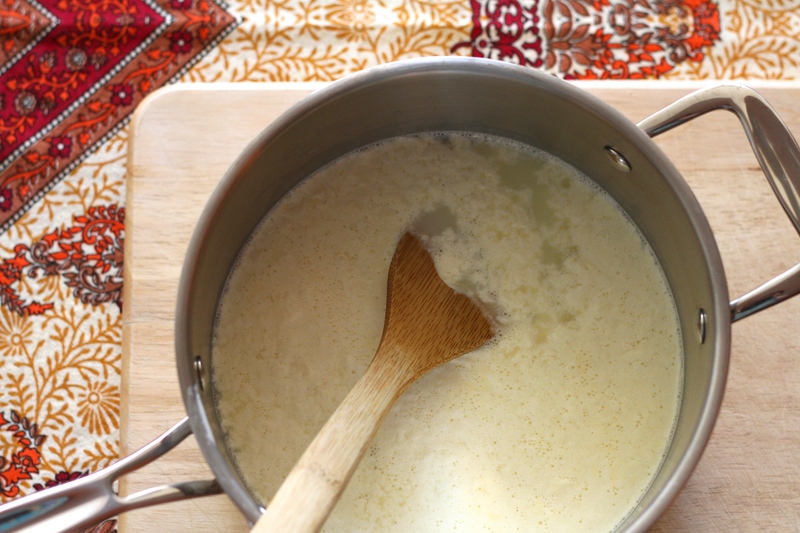 Combine the milk, cream and buttermilk in a medium pot and heat slowly over a medium heat. Keep a close watch, stirring very gently now and then, and when the mixture forms curds that separate from the whey, turn off the heat. This took about 10 minutes for me. Let the mixture sit for 30 minutes, as Brandi says, “to help the curds strengthen”. Line a colander or large strainer with 2 layers of cheesecloth and place over a large bowl. Pour the ricotta into the colander and let it strain until the desired consistency is reached. This recipe makes a soft, creamy ricotta, quite unlike the firm, dry, pressed ricotta usually seen in shops. Still, the consistency is directly related to the length of time that it strains. I wanted reasonably firm ricotta that would sit on the crackers and not run off, so I let mine strain for about four hours in the fridge. 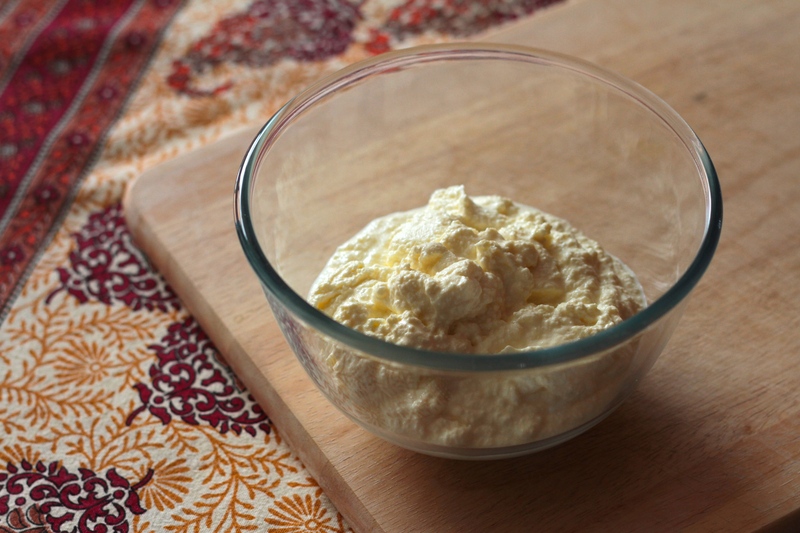 Once the ricotta is ready, transfer to a bowl and stir in salt to taste. 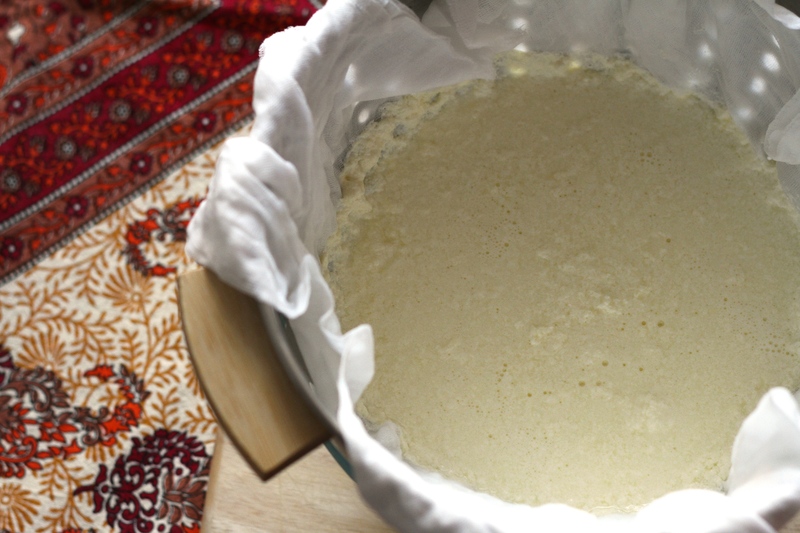 Ricotta keeps well in the fridge if tightly covered. Don’t feel guilty! I completely understand. Just take it as a compliment! wow, I love this recipe. I will definitely give it a go…… and I must say I am totally with you on “the a cake that takes three days to make”. I love a challenge in the kitchen…well anywhere really. I’ve been wanting to make my own crackers for a while but haven’t been able to find a good recipe. These look great! I’m definitely going to try them out. Thanks Catherine, I hope you enjoy them! I think Brandi has developed a great recipe here. Thanks Holly, hope you enjoy them if you do! 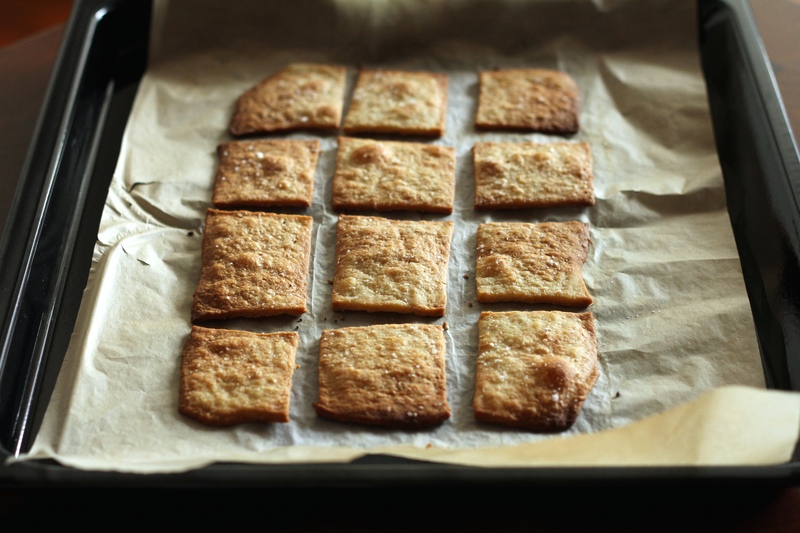 These look amazing – I have to start making crackers – I see a project for this weekend. It’s a perfect project for the weekend! I forgot to say in the post that if you get sick of rolling and baking crackers, just wrap up the rest of the dough in plastic and pop it in the freezer for another day. I usually only use about half the quantity at once, as it makes so many. Wow, I love the crackers, they look gorgeous! My mom loves crackers even more than I do so I should probably make those for her. And the ricotta? Perfect! !